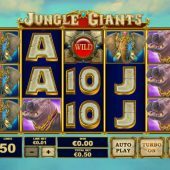 Jungle Giants slot is the third of this genre Playtech have released, after Jungle Boogie and Jungle Trouble but you'll have more likely been familiar with Netent's Jungle Spirit or WMS's Jungle Wild or if unlucky Microgaming's Jungle Jim El Dorado game. So we get it's a common theme, does anything make this special? Well not the graphics as they're pretty basic with the reels set over a steamy valley surrounded by rock carvings of animals and the symbols are equally simple, but you'll see why the word 'Giants' has two meanings here soon! We start off with a standard grid of 5 reels of 3 rows each and you'll notice all the symbols are stacked bar the Wilds which appear singly on all the reels - for now. Dramatic classical music mixed with jungle drums tells you something big is going down here and indeed you have giant 3x3 symbols on the centre 3 reels consisting only of the premium icons, the animals which too are all of a giant species. And there is your two meanings of 'giants' in the title! The card values appear stacked on all reels while the animals only do on reels 1 and 5 therefore with the giant 3x3 animals on the centre reels it means any symbol can fill the whole grid. As we have 50 pay lines this may create some monster hits, so the all-important symbol values now need examining. You can get 5 Wilds but only on one line at once and they would pay 20x bet for 5-of-a-kind. The other icons are disappointingly low though at 3x for the Elephant, 2X for the Rhino, 1.5x Gorilla and 1x for the Hippo or Water Buffalo. The card values are either 30 or 20 coins, so a full screen of the lowest cards would give you just 20x bet while the Elephants would be 150x. Yes, that's what Playtech imaginatively call the bonus and this is triggered by a giant block scatter falling fully in view on the centre 3 reels. You get 8 free games which can be retriggered indefinitely but with two enhancements - firstly all card values are removed and secondly the centre 3 reels are now only populated by giant symbols now including the Wild which also becomes stacked on reels 1 and 5. So now you can achieve the slot's best possible pay, 1000x bet for a full grid of Wilds and are more likely to get a complete screen of any animal icon.